Darlene Yao using the new machine to wrap reusable elastic bandages. Innovation to enable quality improvements can be found in every corner of Michigan Medicine and, often, it can be changes to “mundane” or “typical” tasks that take patient care and safety to the next level. 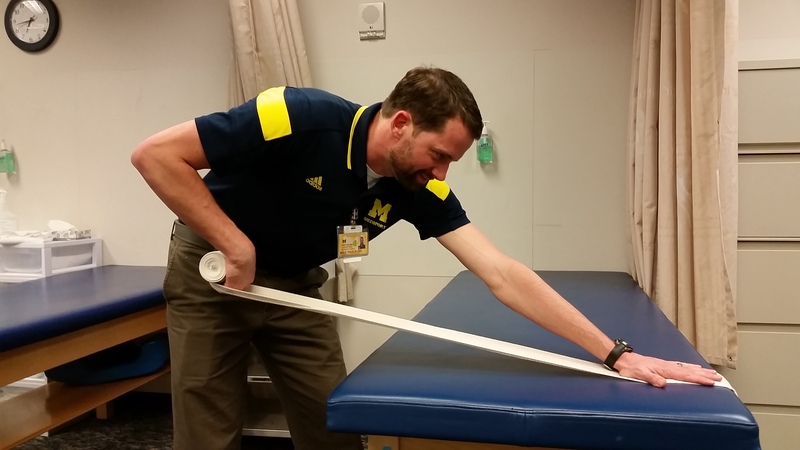 Darlene Yao, clinical research manager of the Michigan Medicine MedSport clinics, exemplified this with her innovation that enhances the way Michigan Medicine handles the thousands of reusable elastic bandages it utilizes each year. “Many of our rehabilitation technicians, trainers and physical therapy assistants were spending hours hand-rolling elastic bandage wraps after they were cleaned and sent back to us from laundry services,” Yao said. It was a routine that had been in place for decades — but it wasn’t something that Yao accepted. MedSport team members used to have to roll all the bandages by hand. Together with a small team from the clinic, Yao recorded wrapping times for a sample of more than 650 bandages. The team found that on average, it took more than 3 minutes to hand roll each 25-yard long bandage, which translated to more than six weeks of clinician time over the course of a year. After doing some research, Yao, who had built mechanical devices before, found that no commercial solution existed yet. “Our initial concept for the machine was essentially affixing two metal rods in a power drill, but it gave us a starting point to improve upon,” said Yao. She took the idea to a colleague, Josh Bishop-Moser, Ph.D., from the U-M Department of Mechanical Engineering, for consultation. Together they worked through several iterations until they reached the final design. The work completed by Yao and her team will be on display during this year’s Quality Month poster session next week at the North Campus Research Complex. Her team’s poster was one of four chosen as an exemplar. The winning poster will be announced during this year’s event. Also honored as an exemplar for this year’s event is a team from MidMichigan Health, one of Michigan Medicine’s partner organizations, who will be participating in Quality Month for the first time. “We are really excited to participate in this year’s Quality Month event and meet teams from Michigan Medicine who are working on quality improvement initiatives because there is a lot that we can learn from each other to benefit all of our patients,” said Caleb Montroy, M.H.A., performance improvement manager at MidMichigan. Montroy is part of the team whose poster, “Increasing In-System Transfer Rates,” examined how to improve patient transfer rates within the MidMichigan health system. Following the 2016 integration of MidMichigan Medical Center – Alpena with MidMichigan Health, numbers showed that only a small percentage of patients who needed higher-acuity care were transferred from the Alpena hospital to another site within the MidMichigan system. Instead, the majority of patients were transferred to locations outside the health system due to relationships that pre-dated Alpena’s addition to the MidMichigan family. Montroy and his team interviewed staff at all levels as well as patients, and conducted on-site observations in the clinic. One of the main issues identified was the length of time it took for patients to be accepted at a new MidMichigan location. Thus, providers preferred to transfer outside of the health system. Following several interventions, which included staff education, clearly defining roles and responsibilities, improving communication processes and implementing telemedicine programs to reduce travel for follow-up appointments, the team improved in-system transfer rates from 15 percent to 32 percent, beating their initial goal of raising it to 25 percent. In addition, the time to accept a transfer was reduced from 45.3 minutes to 15.5 minutes. Both of these projects will be among more than 80 posters highlighted during the Quality Month poster sharing event. Event details are included below and a full agenda can be found on the Quality Department website. All faculty and staff are invited to attend.